Well, here’s an interesting interview I just had with the guys working on Operation Black Mesa and Guard Duty. There’s an announcement at the beginning, along with a couple of exclusive screenshots, one piece of concept art and a wallpaper. I am sure the guys will be dropping by, so if you have any questions for them, just ask, although I can’t guarantee they will answer them. So, first of all, thanks for agreeing to this interview. Before we begin, we have that World Exclusive Announcment: Operation Black Mesa and Guard Duty are joining forces! Let’s clarify this. They are not merging into one mod, they are merging their teams in an effort to ensure consistancy of design across both mods. They will be sharing assets and maybe even team members. Have I got that right? Actually, how would you put it? MR.sugar: “Pretty much what you say. What’s going on right now is that we are one team, Tripmine Studios, working on two projects. We share content, assignments, ideas, suggestions and feedback across both projects. Still, both mod projects are independent on each other in terms of release date. Why don’t you start by introducing yourself and telling my readers a little about you and what you do on the team. MR.sugar: “I’m AntonÃ­n “MR.sugar“ Å½oha and I’m 20 years old. I living in Prague, the capital of Czech Republic. Sadly, I’m still a student and it takes a lot of time I wish I could spend on the modding instead. I’m the guy who started the Guard Duty project back in January 2009 and my role there is a team leader and level designer. 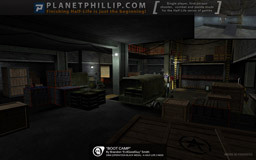 As for Operation Black Mesa, I’m a level designer here since 2007. EvilGoodGuy: “My name is Brandon Smith, a.k.a. EvilGoodGuy. I am 21 years of age and I currently reside in the rainy state of Oregon in the USA; though in a couple of months I will soon be living in Washington – the home of Valve Headquarters! I first joined Guard Duty in June of 2010, then a little over a year later I joined Operation Black Mesa in July of 2011. My main role on the team is as a Level Designer. The Chapters that I’m tasked with remaking are: Boot Camp (both MP and SP versions), Duty Calls, and the first half of Captive Freight. I have also recently taken on the Lead Level Designer position for Leap Of Faith and Power Struggle, which I share with another level designer of the GD team, Ratboy. Other than Level Design I also create props and world textures for my maps. I know how to go through the entire modeling process which involves: creating the mesh, unwrapping, texturing, building a collision mesh, rigging, animating, and compiling all the files that produce the final model which will be used in-game. Why did you start each mod? MR.sugar: “I didn’t want to start Guard Duty at all. Still, after the previous attempt to remake Blue shift failed (Barney’s Tales), I thought that Blue shift is my favorite part of Half-Life and it deserves being remaked along with Opposing Force and original Half-Life. The final impulse was a message from a guy, Enraged, who helped me start this project. He said he likes my work and he thought I’m the right person to start working on this. He managed to convince me and thanks to him this team exists. EvilGoodGuy: “I joined GD because I had never been on a mod team before, so I didn’t want to jump into a project that would be released then forgotten about 2 weeks later. I saw a remake of a popular classic game as being something that would live on past its initial release period. Being a remake, it’s sort of like having a rough draft for a lot of your work already, so I figured it might be an easier project for me to start out on. I have to admit that I am not really a big fan of “remakes”. Why not put all that energy into creating something new? MR.sugar: “The reason I think we all have in common is that we love everything about Half-Life universe and once we have spotted all the possibilities Source engine offers, we imagined how cool it could be if someone moved Half-Life and it’s expansions and enhanced it with all the new features. I myself hate remakes as well, but I can’t tell all of them are bad. I think I like the remake of the first Tomb raider more for example and I definitely prefer US version of The Ring (1) to the original one. These are just exceptions though, I consider most remakes a garbage, whatever we speak of movies or games. The point is in how you handle it. It may not look like that, but even remaking something can be creative process and the final result can overcome the original. EvilGoodGuy: “This is a fairly tough question to answer, because I don’t think even I know the full reasons behind why I chose GD and OBM over something more original haha. Let’s talk about the “merger” for a moment. Whose idea was it? Were the other team open at first, or did you need to convince them. MR.sugar: “On both sides were people, who just didn’t want to merge and vice versa. The have been several reason for this skepticism. How different are the team’s dynamics? Does this make a difference? MR.sugar: “One of the very first things we considered when speaking of the merge was the team dynamics. We are sure that it’s important for both teams to have same, or at least very similar team dynamics to ensure smooth development. Operation Black Mesa had to change it’s approach to make it fit to the Guard Duty team workflow, as they older workflow wasn’t very good as it even caused some complications in the past. What went better than expected? MR.sugar: “Almost everything. There is still a lot of stuff that can turn out bad, but I’m pleasantly surprised how smooth was the entire process to date. Did you have to backdate much work? I mean, to get that consistency we mentioned at the beginning. EvilGoodGuy: “Surprisingly there really wasn’t much content which we had duplicates for. The major conflictions are important NPCs such as the houndeye and bullsquid, which had already been made for each mod before the merge. Seeing as a lot of work was put into both versions and although one might be better than the other, it’s a complete shame if one is scrapped just because our teams merged. We are currently experimenting with ways to see if it’s possible to keep keep both versions in the mods without causing confusion. The current idea being thrown around is for one to represent a male, while the other be the female counterpart. Whether that idea will work or not is still up in the air. How do you communicate across teams? Did you have to change software or processes? MR.sugar: “Nope, the basic communication works the same way it used to work before the merge. I presume that both team leaders remain in control of their own team. Is that right? Well, as a long time follower of both projects, I’m very excited about these news! Keep up with the awesome work guys, and thanks for the interview. Here’s hoping 2012 will be a good year for Tripmine Studios. I wonder if the Fortress Forever team will be invited into Tripmine studios cause their Team Fortress Classic Source port/remake is not very popular.I have seen the team have some very good modelers,script writers and other stuff.If the team is still alive today.